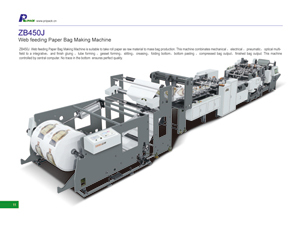 ZB450J Web Feeding Paper Bag Making Machine is designed for mass production of bags from roll paper. It integrates technologies from various fields such as mechanics, electrics, pneumatics and optics and conducts gluing，tube forming，gusset forming，slitting，creasing, bottom folding，bottom pasting, compressing and finished bag outputting all at once under the control of central computer. Bags produced by this paper bag making machine are featured of traceless bottoms and high quality. Feeding Unit:computer-controlled; automatic feeding and tension controlling; speedy productivity; easy to learn and operate. Cutting Unit:controlled by central computer to ensure relative accuracy of paper bag length within a deviation of ±0.5 mm. Bottom Clutch Function: reducing waste in separate debugging of traction and bottom gluing part. Bottom Pasting Unit: keeping several patented technologies; producing traceless bags by adopting the latest technique in gluing bag bottom. Color Code Tracking Function: tracing color code to keep accurate size of each bag. Screw Rod Adjustment Device: shortening adjusting time and improving production efficiency; making handbags of different specifications. Applicable Paper: Kraft paper and art paper (including film-laminating paper) are applicable on this web feeding paper bag making machine.